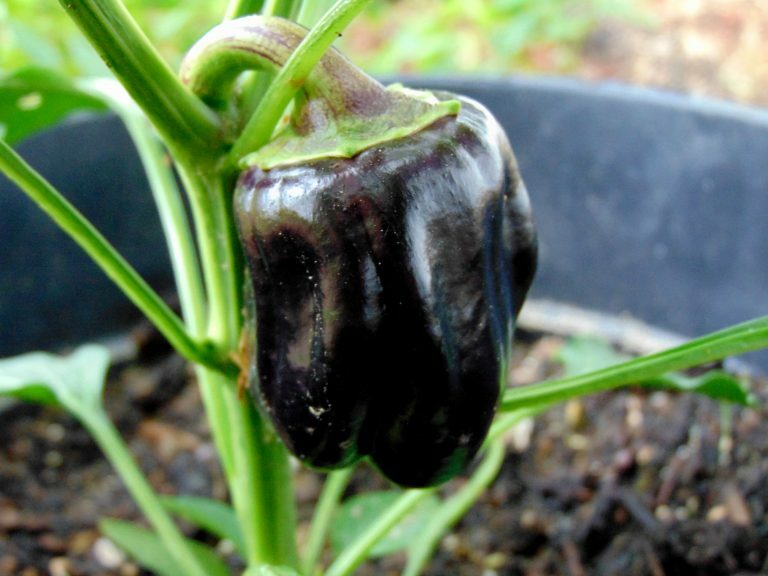 The Purple Beauty Sweet Peppers are growing healthy in containers. There are two pepper plants growing in the garden's shade area as an experiment, and other varieties grown under full sun. These are doing very good and are producing big fruits. The other varieties growing under the full sun are growing very slow and have remained as tiny plants for a very long time. One thing that is very hard to tell with these peppers is when it's the correct time to pick them. As you can see in the photo, their color is very dark purple, almost black, but they have been this color since they were little, and they keep growing. There are more peppers coming up but looks like the plant is using all the energy to grow this pepper. In addition to peppers, there are more varieties of edibles growing in the garden. Check the garden inventory to read about our experience growing other plants.